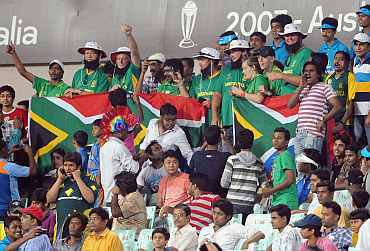 Morne Morkel and Robin Peterson scalped three wickets apiece after JP Duminy struck a brilliant 99 to enable South Africa register a thumping 131-run win over Ireland and become the first team to qualify for the quarter-finals from Group B in Kolkata on Tuesday. Chasing a challenging 273, Ireland struggled from the start as Morkel (3/33) and Peterson (3/32) ripped apart the batting line-up to bundle out the Irish for 141 in 33.2 overs at the historic Eden Gardens. Earlier, put into bat, South Africa had a wobbly start as their top order collapsed in the absence of leading run-getter AB de Villiers, who is down with a thigh strain. But sensible batting by left-handed duo of Duminy and Colin Ingram (46), who were engaged in an 87-run partnership for the sixth wicket, led the fightback and guided South Africa to challenging 272 for seven. With eight points in their kitty, South Africa cruised into the last-eight stage and will take on Bangladesh in their last Group B league match on Saturday in Mirpur. The loss meant Ireland are out of the quarter-final race and will face the Netherlands in their last inconsequential group match here on Friday. Defending the target, South African speedster Morkel accounted for the Irish opening duo of William Porterfield (6) and Paul Stirling (10) inside the fourth over to give his team a flying start. Wickets continued to tumble at regular intervals as the Irish hope began to fall flat in front of a boisterous Eden crowd who turned out in large numbers. Ed Joyce (12) and Niall O'Brien (10) too departed quickly to expose the Irish middle-order as the required run rate began to shoot up. After being hit by a Kallis bouncer, Kevin O'Brien, who was their star in the win over England, looked for some damage control, building the Irish fightback along with Gary Wilson with a 41-run stand for the fifth wicket. But the Irish hopes faded when left-arm spinner Peterson evicted the dangerous-looking O'Brien (19 from 24 balls) and followed it up with the wicket of Wilson, who looked good in his 31-run innings from 48 balls (4x4, 6x1), in the same over. Peterson's fine spell exposed the Irish tail reducing them to 107 for seven in 26 overs. 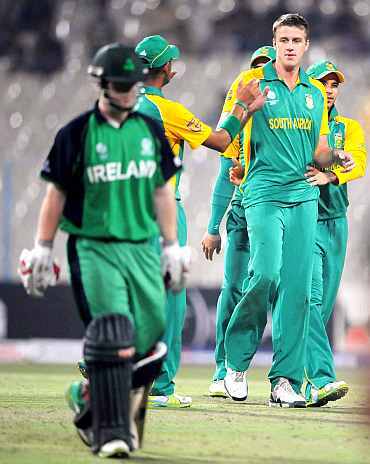 From there on, victory was just a formality for the Proteas as the inexperienced Irish side was going through the motions. Earlier, there was heartbreak for Duminy, who missed out on his first World Cup century by just one run. He led the Proteas fightback after their top order collapsed to 117 for five inside 27 overs. The South African batting line-up dished out an erratic display as the top-order did not have any partnership going. 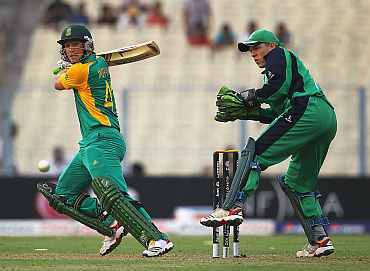 Hashim Amla (18), Graeme Smith (7), Morne van Wyk (42) and Jacques Kallis (42) were done in to some fine fielding and tidy bowling efforts by the Irish. 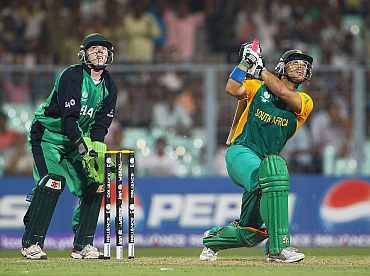 But Duminy led the fightback in the company of Colin Ingram (46), who made his World Cup debut in place of De Villiers. Ingram showed a lot of character in his 43-ball innings, which was studded with seven fours and along with Duminy rescued South Africa from further embarrassment. The day, however, belonged to Duminy who slowly built his innings showing tremendous resilience en route to his 13th ODI half-century and best World Cup score before missing out on what could have been a brilliant century. After Ingram's dismissal Johan Botha (21 not out from 28 balls) extended a fine support to Duminy as they added 65 runs together for the seventh wicket. Anxious to get to the three-figure mark in the final over of the South African innings, Duminy miscued a shot from John Mooney and skied the ball to Kevin O'Brien. Duminy struck six boundaries and one six during his 103 ball vigil at the crease. For Ireland, George Dockrell (1/37) and Stirling (1/45) did an excellent job.